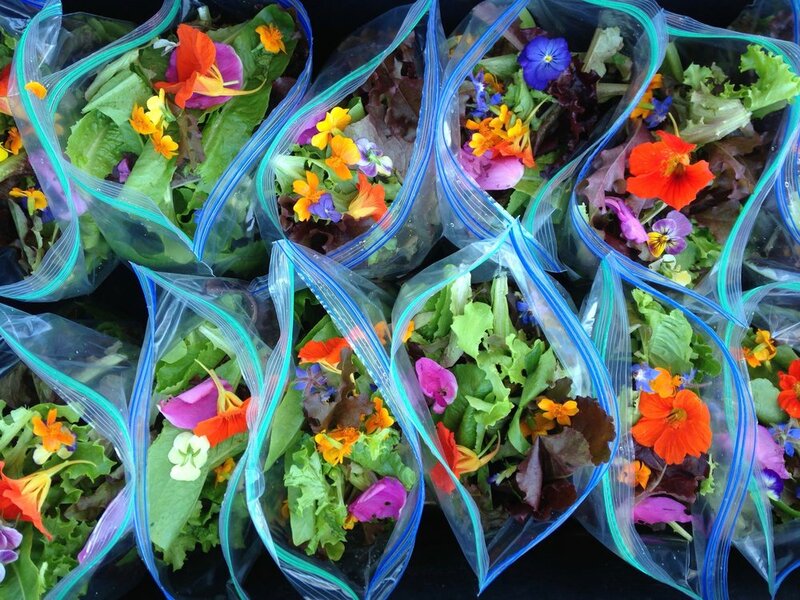 Our salad blend, which includes five different types of edible flowers! Yellow Birch Farm is a family-run organic farm in Deer Isle, Maine with strong ties to the community. We produce a variety of vegetables and fruits as well as farmstead goat milk products including cheese, caramel, and soap. We sell our own produce, eggs, and baked goods and other local products at our farm stand, and we provide vegetables and goat cheese to local restaurants and four local farmers’ markets. We also host farm dinners during the summer, featuring local chefs, which highlight the delicious bounty of the farm. The farm is made up of 52 acres of land including 40 acres of beautiful woods, home to one of the largest yellow birch trees in the country. About a half-acre of the farm is in full vegetable and fruit production, including fields and greenhouses. The farm is a dynamic place with many visitors coming to shop at the farm stand, check out the gallery, visit the goats, or walk down to see the yellow birch tree. We are recruiting for farm interns to join our team for the upcoming spring and summer season, and potentially longer-term. Interns will have the opportunity to participate in the full range of farm tasks related to agricultural production, dairy goat care, cheese making, farmers markets, and ongoing farm maintenance. Responsibilities will include weeding, bed preparation, planting, watering, and harvesting crops; tending to chickens and pigs; feeding, milking, care, and barn maintenance for goats; preparation for markets and stocking and cleaning of farm stand; filling orders and deliveries for restaurants; firewood processing and other woods work; maintenance of greenhouses, fences, and other tasks as needed; and preparation and serving for farm dinners. There will be other tasks throughout the season, which could include metal working, repairs, tool sharpening, waiting on gallery and farm stand customers, building a new barn or greenhouse, and more! There are many opportunities to practice skills and learn new ones, and each day will bring new experiences. Enthusiasm and willingness to learn are a must! Interns will be provided with housing on the farm in a converted loft over the pottery studio and cheese kitchen. The loft space includes basic furniture and has electricity, water, and Wi-Fi. We provide the basics, but you are welcome to bring your personal affects to make the space your own. Interns will share the bathroom and kitchen facilities in the main house, a few steps away. We ask that all interns respect our home, and everyone is responsible for cleaning up after themselves. Room and board are provided. Interns are asked to prepare their own breakfast, but lunch and dinner are generally communal meals with everyone taking turns preparing food and cleaning up. Interns will have one day off per week, generally Sunday or Monday, which will rotate depending on seasonal demands. We also offer a small weekly stipend in the summer season. Interns are required to provide their own health insurance. Deer Isle is a rural island (we have a bridge to the mainland) in Down East Maine with a diverse, but small, year-round community and a bustling summer tourist season. The area provides many opportunities for outdoor fun and recreation including hiking, kayaking, swimming, and boating. There is also a lively contingent of artists, including the Haystack School of Crafts, which offers many chances to see lectures, slideshows, and openings. There is a local movie theater and there are also frequent community events. There is a great network of local farmers and artisans to meet at markets and events around the Blue Hill peninsula. Interns will have access to these opportunities and more during the season, and we encourage you to get out and explore this beautiful area while you’re here. Please send your resume and a brief expression of interest to greeneziner@gmail.com. Feel free to reach out with any questions too!